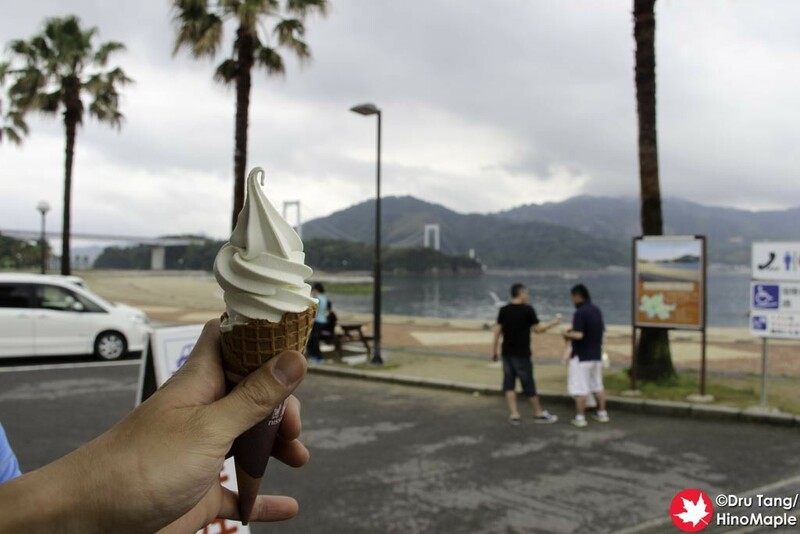 There are 2 famous types of soft serve ice cream on the Shimanami Kaido. 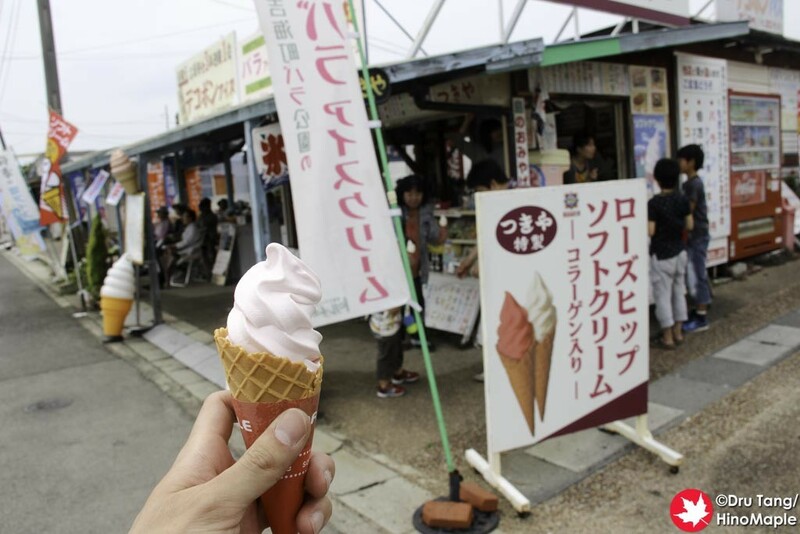 On Hakatajima there is the salt ice cream, and on Oshima there is the rose hip ice cream. It was a goal of mine to try them if I could and I was lucky enough to try both of them. 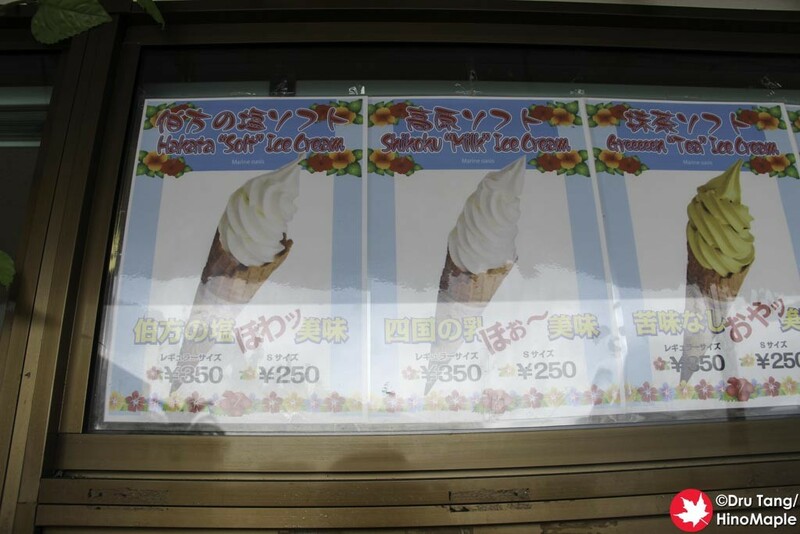 The salt ice cream is only available at the Hakata SC Park on Hakatajima. This ice cream is famous because Hakatajima has a famous salt factory, Hakata Salt. A lot of people know this brand in Japan and they have a lot of salt products. The ice cream is salty, but you can think of it like putting salt on watermelon or other fruits; it may be a little salty at first but it becomes sweeter in the end. I really didn’t like the first couple bites but it did start to taste normal afterwards. What was the final verdict? If you want to try it, give it a try, but if you don’t, you aren’t missing too much. The rose hip ice cream was a lot better. The pink/purple colour of the ice cream is really nice and pleasing but the flavour is really muted. I wasn’t expecting too much as using rose essence or rose petals must be difficult for flavouring. I was mostly amazed by the lovely colour but when I started to eat the ice cream I couldn’t help but notice it wasn’t anything special. I guess my taste buds really need strong flavours. The only place to get the rose hip ice cream is at the Yoshiumi Rose Park. 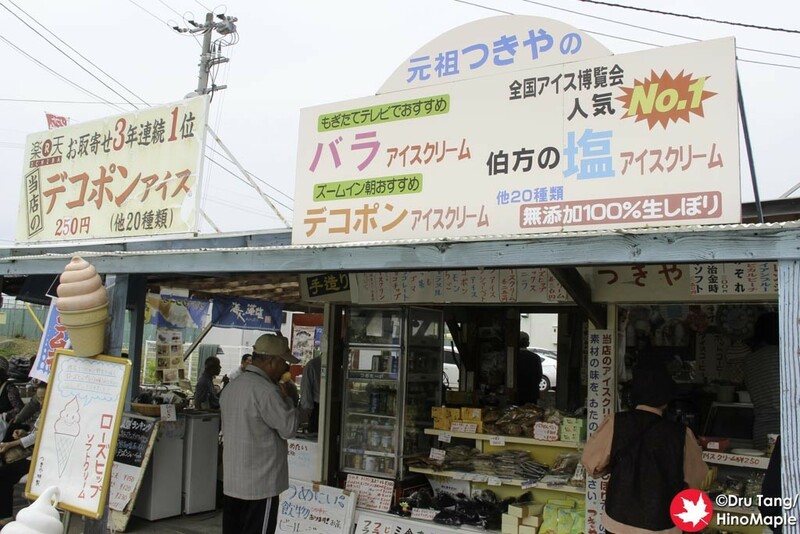 They have a small shop and if you go at the wrong time it is very busy. Try to keep calm and understanding of the old people and kids who take forever to order, but it will come. If you don’t like sweets, then you don’t need to try the rose hip ice cream, but if you do, I would recommend trying it but don’t expect a miracle of flavours. 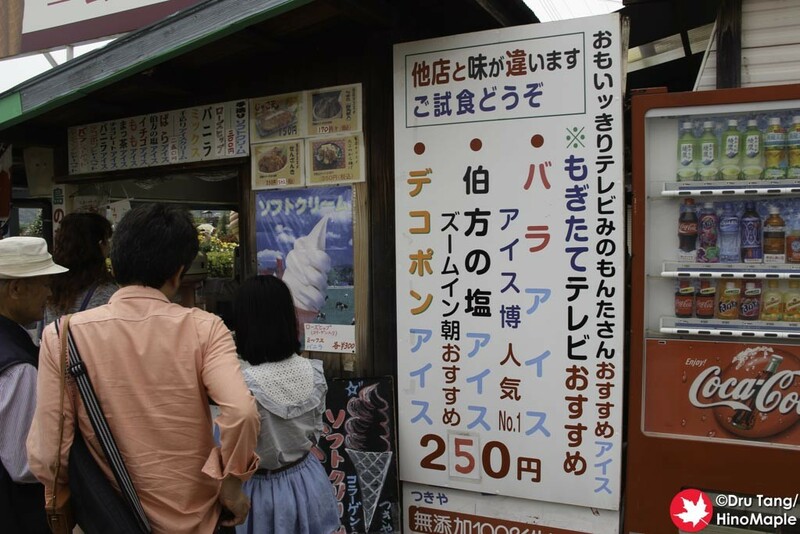 The ice cream is a good tourist draw and will help draw people to the islands. It did make me curious and I did buy the ice cream but I think it is just a side attraction. Comparing the two, I would only recommend the rose hip ice cream because it tasted good, but the salt ice cream should not be overlooked either. I didn’t really like the salt ice cream but people have different tastes so you may like it whereas I didn’t. This entry was posted in Shikoku Food and tagged Hakata, Hakata SC Park, ice cream, japan, Oshima, Rose Ice Cream, Salt Ice Cream, Shimanami Kaido, Shimanamikaido, Soft Serve, Soft Serve Ice Cream, Yoshiumi, Yoshiumi Rose Park by Dru. Bookmark the permalink.